One thing that frustrate AutoCAD users who are migrating to MicroStation is finding similar tool in MicroStation. I believe the MicroStation users who are migrating to AutoCAD will have the same problem as well. I have posted how you can find the similar tool in MicroStation. 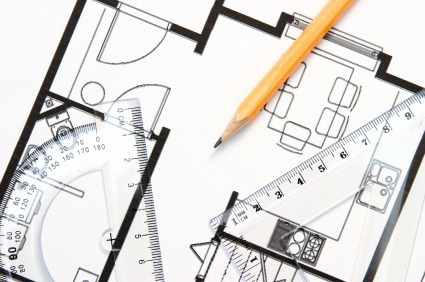 However, finding the tool doesn’t mean you can use it like in AutoCAD. Many tools work differently. One question I have in common is ‘what is similar to AutoCAD MATCHPROP’? If you have tried the DWG key-in, then you will find SmartMatch is the equal tool. Then why the attributes are not changing? 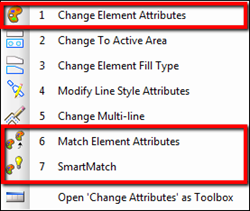 We don’t use SmartMatch to change object attributes, but using change element attributes. Before we discuss about match attributes and change attributes in details, let us see how to change the attributes, matching to existing object quickly. 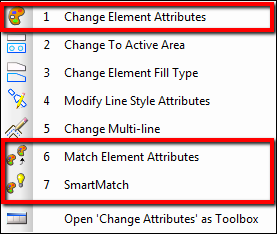 Activate the change element attributes, and see the tool settings. 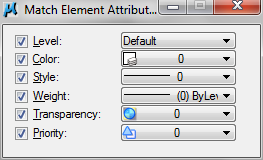 You can click the match element attributes and pick an object to obtain the attributes value. 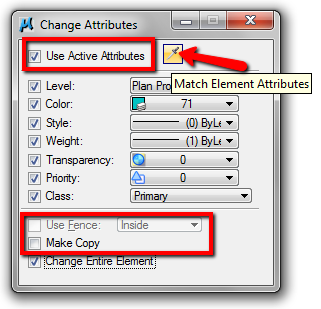 You can activate use active attributes to also change the active attributes to match the selected object attributes. If you don’t want to affect the active attributes, the leave it unchecked. Now you can activate any properties you want to change. You can also use fence for changing multiple objects attributes, and you can also create a duplicate without changing the original object attributes. But this tool is only for changing the attributes. You don’t change the text style, dimension style, hatch/pattern, etc. You need to use different tool for that. So many of them? Yes, they are. But don’t be intimidated. I believe you will only use several of them frequently, but at least now you know there are tools for those purposes. Those tools are only to change the active attributes or styles, to match the attributes of the object you selected. The idea is to allow you to create new objects with the same attributes with existing element. To change other objects attributes, you need to use change element attributes. Well, and the other tools like change dimension and change text attributes. Let us try it. Activate match element attributes. You will see the tool settings like this. Activate the attributes you want to match. Now pick any object from your drawing. You should see the attributes updated. See that the active attributes are also updated. Try to use other match tools. We already discuss how you can change element’s attributes. But as I mentioned before, you may need to use other change tools to change text attributes, dimension attributes, etc. It is basically the same with change text attributes. See that you can change dimension style with change dimension tool. Try different tools for changing the styles to see how they work. You know where to find those tools, don’t you? You can find change text attributes under text tools group, and change dimension under dimension tools group. See how you can use change elements attributes on our YouTube channel. 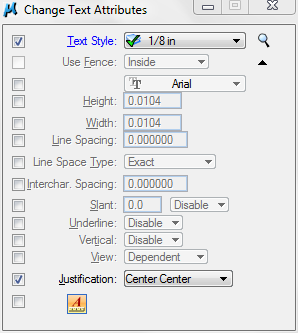 I would appreciate hints on how I can match text heights and widths in microstation. This as we know is easy to accomplish in AutoCAD but I have many text that I need to change the attributes in microstation and I don’t want to be clicking and changing them individually. I need a tool like match properties in AutoCAD. Do You know any available microstation tool which can be used to connect 2 objects, a sort of ‘connector’ or ‘leader’. Not only graphically (i.e. with an arrow on terminator) but I’m looking for sth which will make a linkage. Is there a way of using this tool on a reference? Thanks for the article. I have a question regarding using the fence to select objects. In your image, the fence is greyed out, and when I use the tool it is also greyed out. How can I select the fence so I do not have to pick each element individually? Thanks. You need to create the fence first. Have you seen the video on YouTube? It shows how to use fence there. Edwin, I like your style of writing and presentation. It is onversational, friendly and easy to understand the contents. Oh Autocad, how my heart desires thee… Microstation's match tool is an embarasment, much like many other features or lack of. I cannot believe people put up with it (me specially). It should be no more than 2 clicks to do something simple like this. Thank you for sharing Viktor. As a user, sometimes we have no choice except using what our company gives us. Or because our client want us to use it. Are you using MicroStation only, or you also use their vertical products? We don't use vertical products yet, although there's a suite by Bentley that would help quiet a bit. It seems that it would be light years before we get all the departments, managers, supervisors to agree on it though. i tried to make the last line round at its starting point & sharp at its end point. I am not able to do so, either its making both the end round or sharp.